The Savoy’s American Bar in London has unveiled a new cocktail menu inspired by musicians who have entertained guests at the iconic hotel. 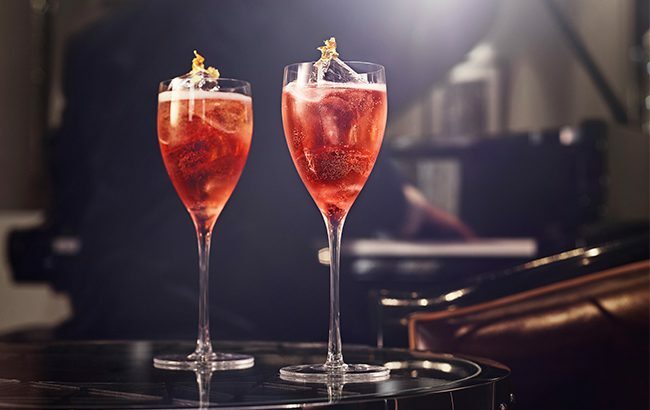 The new menu, called The Savoy Songbook, features a collection of 20 cocktails that delves into the hotel’s history of musical moments. Since the bar’s opening almost 130 years ago, the venue has featured live entertainment from a piano player seven days a week. The American Bar’s resident pianist Jon Nickoll is the fifteenth piano player at the bar, preceding the likes of Mike McKenzie who played at the venue for 25 years to singer and pianist Dave Lewis. Created by the American bar team and led by head bartender Maxim Schulte and director of bars Declan McGurk, the new music-led menu is structured to mirror the track listings of an album. Each drink on the list refers to a memorable line in a song that provides its inspiration. Cocktails on the menu include Somewhere Sailin’, which is inspired by Jazz song Beyond the Sea and “reflects the tempestuous nature of the ocean”. George Harrison’s song Here Comes the Sun was the base for the cocktail Sun Sun Sun, which features flavours of orange blossom, yuzu wine and lime. A sharing cocktail, called I Love You, pays homage to Nancy and Frank Sinatra song Somethin’ Stupid, while the Electric Lover serve, a riff on Prince’s Purple Rain, contains glitter. The Savoy Songbook menu will be released in April alongside a live album, recorded by Nickoll. The album features recordings of the songs that inspired each cocktail on the menu. It will also be available to stream on Spotify once the menu launches. Click through the following pages to see a selection of cocktails on The Savoy Songbook menu.